Dogecoin is a hard fork of litecoin, which was designed to be a friendly, more approachable form of cryptocurrency that could cover maximum users intimidated by the complexity of Bitcoin. Dogecoin has one of the largest and most active communities in the cryptocurrency world. Dogecoin, today, is commonly used as a tipping service. Users will tip other users for posts or contributions that they believe deserve recognition and have more impact. 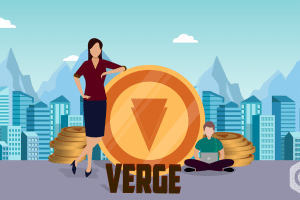 The dogecoins were rewarded to the users based on the quality and the quantity of the content. DOGE is being traded at 0.003027 USD on April 03 at 07:34 UTC. 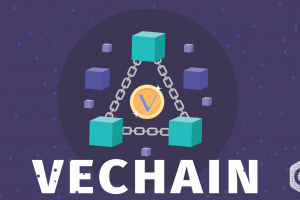 Based on its market cap value of USD 359,922,882 and the circulating supply of 118,919,193,294 Doge coins, it is ranked the 25th largest crypto in the market. 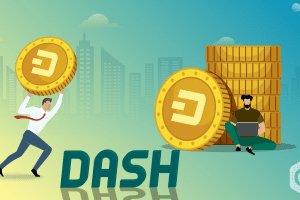 The current trading value of Doge surged up to USD 382,074,337, and its corresponding trading price amounts to 0.003213 USD or 0.00000064 BTC. 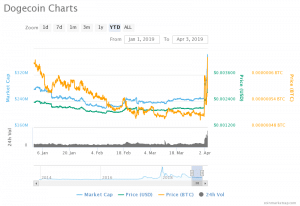 The 24-hour price movement indicates that $85,569,309 worth of DOGE was trading. 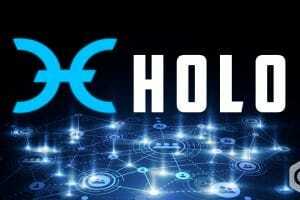 The trading value and price have shot up by 32.90% and 32.88% respectively in 24 hour time period. The market opened at USD 275 million at the beginning of January 2019. However, the market went downtrend right after and reached its all-time low on the closing of February 07 at 23:34 UTC with the values of USD 217,663,756 and a trading price of 0.001842 USD. There was a moderate and gradual increase in the values until April 01. The numbers jumped from USD 250 million to USD 290 million on the same day with a time difference of 8 hours. The market further shot up reaching the current value. The 20-day exponential moving average exhibits an uptrend with the values rising from USD 241,487,072 and trading price of 0.002035 to the current value with an average hike percentage of 58.055%. The rise in trading price to the present day’s price is an increased value of 57.89% which offers good resistance support. The overall market is under the bulls pressure. 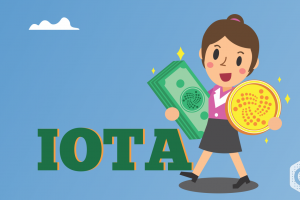 Although there is a sudden surge in price within 24 hours, there is no evidence for the continuation of this growth in the future. Wallet investor predicts that in one year time period, there will be an increase of only 4.58% from the current price. The price per token will sell at 0.00336 USD in 2020 and by 2024; the price would touch 0.00472 USD. Nonetheless, crypto ground believes that long term investments on Dogecoin will be beneficial. 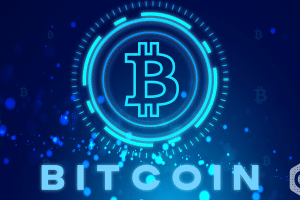 The site estimates the price to increase by 32.20% by 2020 and reach a price of 0.0042 USD and by the end of 5 years, there will be a hike percent of 307.54% and the trading price would reach 0.0130 USD. Also, technical analysts from digital coin price also expect a hike in price values- 0.00546562 USD by the end of 2019 and 0.01229085 by the end of 2024. 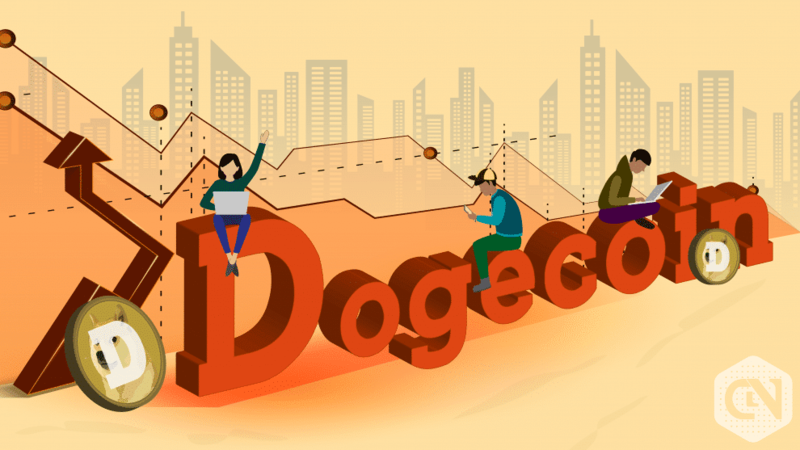 Though the predictions point in terms of Dogecoin’s potential to hold for long term investment, the current market has a sudden rise in values and is unpredictable. All the measures point in favor of the buyers; however, the market trend has to be observed by the investors before taking a step further. This market can be utilized by traders to earn good profits. Ethereum Classic (ETC) Price Analysis: No More a Flat Market Trend for Ethereum Classic!